Poria & Gardenia Combo Extract (formerly listed as: Amadio Skin Formula, Armadillo Counter Poison) reduces itching, promotes blood circulation, and remove toxins. Helpful for skin problems characterized by redness, itching, inflammation, or pain. Take 4-6 pills three times a day. Depending on the problem you may need to use for 2-3 weeks or longer. 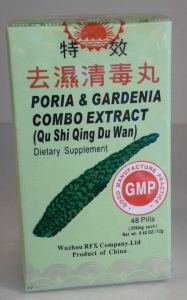 Contains: Poria, Japanese Honeysuckle flower, Rehmannia (unprocessed), Chinese Skullcap root (scutellariae), Xanthium fruit, Gardenia fruit, Forsythia fruit. Note: The box this product comes in has been redesigned to comply better with US dietary product labeling regulations. 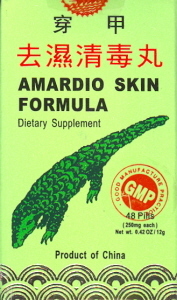 Previously ingredients under the Armadillo Counter Poison name were listed as follows: Plastrum Testudinis, Taraxaci, Atractylodis, Coicus, Sophorae, Ledebouriellae, Dictamni, Lonicerae, Angelica, Zaocys. Products may from time to time be available under either box label.